Capt. John Lipscomb describes boat repairs. 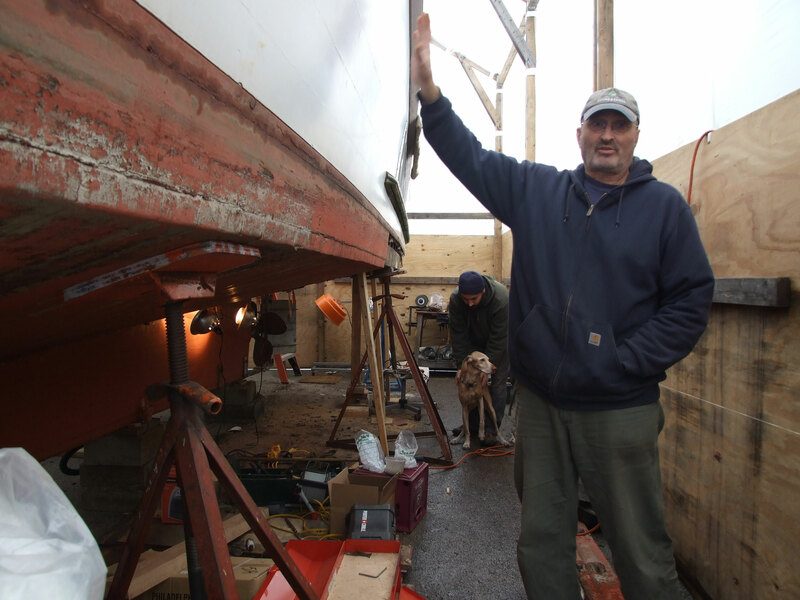 In the background: Chris Brennan, boat builder, and his 12-year-old dog Tobi. Riverkeeper’s patrol boat—an icon of the Hudson, and an essential tool in our organization’s work to protect the river—sits under a temporary tent on the Ossining waterfront, a yawning hole in its bottom, and a growing collection of rusty plank nails accumulating beside it. To the untrained eye, it looks bad. After all, it’s these nails that hold the cedar planks to the bottom and prevent the boat from taking on water. 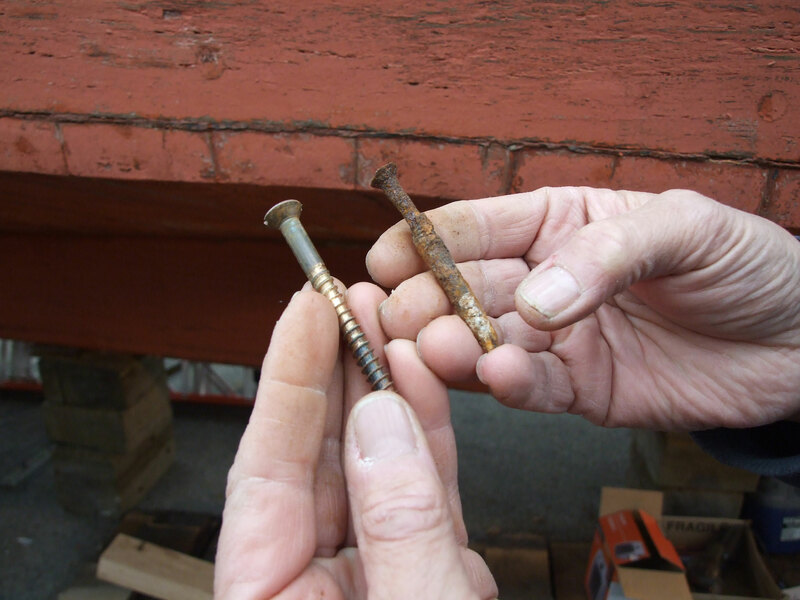 And those rusty fasteners are worn so thin it’s hard to imagine them as the sturdy galvanized steel they once were. “When a fastener fails and a plank comes loose on a wooden boat underway, you spring a plank and then you sink very fast,” Capt. John Lipscomb said. In reality, exposing the boat to this treatment is preventative. As Capt. Lipscomb racked up miles on patrol—about 5,000 in 2012, and about 60,000 over his 12 years on the job—the R. Ian Fletcher takes on no significant water. Replacing the plank fasteners now could prevent an emergency that jeopardizes the boat, or puts it out of commission during the patrol season. Riverkeeper is asking our members and the public to help fill the coffers to offset the cost of this work. 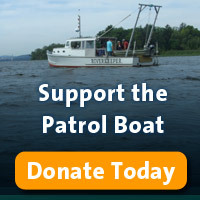 In all, the boat, its repairs, and the program it supports will cost about $40,000 this winter. We’re trying to raise $40,000 before Capt. Lipscomb launches the boat again this spring. Please make a tax-deductible donation today to support this work. All those who give $1,000 or more will be invited to join Capt. Lipscomb on the boat, and all those who donate $250 or more will be entered to win an invitation. For the Riverkeeper patrol boat's plank nails, it's out with the old and in with the new. That—putting years of life on a 30-foot wooden boat—is Capt. Lipscomb’s goal. In addition to the re-planking this winter, the boat will undergo soup-to-nuts maintenance, including painting, work on electronics systems and restocking. Reams of oil-absorbent pads are stocked beside the boat, a reminder of the boat and its captain’s role in preventing, investigating and stopping pollution. For a sense of how varied, extensive and important the work done by boat is, take a look at the map below. Please help keep Riverkeeper’s eyes on the water by making a donation today.